The pharaoh ant received its name when it was mistaken as one of the plagues of Egypt at the time of the Pharaohs. Experts believe these ants are native to Africa. Indoors: Wall voids, behind baseboards, in furniture, under floors, and between objects located in warm (80-86°F), humid (80%) areas near sources of food and/or water. These pests are common problems in hospitals and health care facilities, food-handling facilities, hotels and multi-unit housing, and other large structures. 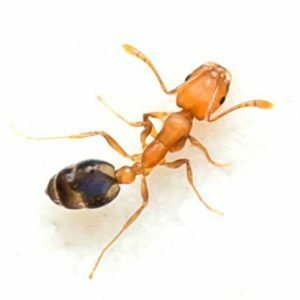 Outdoors: In northern U.S., these ants can’t survive winter outdoors, but in subtropical areas such as Florida and Hawaii, they survive all year. Thousands to several hundred-thousand workers per colony, with several hundred reproductive females. Pharaoh ants are believed to spread various diseases and are considered a health threat, especially in hospitals and health care facilities. Pale, varying from yellowish to reddish, with abdomen often darker to blackish. Pale, varying from yellowish to reddish, with abdomen often darker to blackish. Queens are slightly darker. Workers measure 1/16 of an inch (1.5-2.0 millimeters) long. Queens are about 1/8 of an inch (4 millimeters) long, with or without wings. Throughout North America and the world. From syrups to fruits, sweets and desserts, meats and dead insects, they have a wide preference in food. They use carbohydrates as an energy source, and protein to fuel larval development and egg production in queens. Mating takes place within the nest, so there are no flights of swarmers. Workers live nine to 10 weeks, with up to 10% foraging at any time. Queens can live four to 12 months, while males die three to five weeks after mating. Finding multiple nests is difficult. Normal spraying usually results in more nests and spreading of the problem because of the many reproduction queens.